One of the most common questions asked is how quickly can you digitize my pictures? Often this is for a memorial service, last minute anniversary gift or to rush and protect pictures from natural disasters. The answer is as quick as the same day. 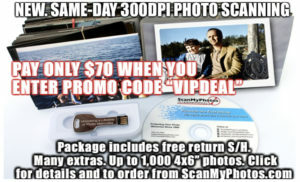 This deal was discounted 40% to just $125 to professionally digitize up to 1,000 standard 4×6” photo snapshots to 300 dpi JPEG images on a standard DVD data disc. BONUS: WHEN YOU ENTER PROMO CODE “VIPDeal” PAY ONLY $70. BUT WAIT. THERE IS MORE. Save 10% ON ALL ADD-ON SERVICES WHEN YOU ALSO ENTER “VIPDiscount” PROMO CODE AT CHECKOUT. See below for details on express same-day scanning. This order includes instant same-day uploading of your files to you. Free USPS Priority Mail return shipping and handling and return tracking for the original photos and data disc DVDs (a $19.95 value). Many popular add-on featured services are available including other-size photos, flash drives, color-correction, return delivery tracking and more when you order at the time of purchase. *See below details for same-day scanning. You are responsible for paying to mail your pictures to us and we recommend using the U.S. Postal Service’s Priority Mail Flat-Rate box. We cover the return S/H cost to you. Purchase this deal online and print your invoice to include with your order. Your completed order form must be included in the box along with your photos. Your original photos will be returned along with your DVD data disc. Additional Add-on products are available, including USB flash drives. On the order form, you will find a bevy of additional options to enhance your final scans. Order the additional options at the time of purchasing this deal. During checkout, you will have the option to select any additional services. IMPORTANT: LIMIT 8 Express Photo-Scanning Packages Per Address. This service is exclusively for online, mail-in only, and positively cannot be used for any walk-in services, for any reason or applied to prior orders. Photo scanning only. *BONUS: Get Same Day Scanning Included With Your Order. Just type “Same day scanning” under special instructions. If received by 10 AM (PT), your order will be scanned the same business day it is received. If received afterward, please add one more business day. Some conditions apply including delays due to holidays, weather and other issues. While we cannot warrantee same-day scanning, we do make every effort to scan the same day your order is received. Standard 4×6″ photographs only. Other sizes and options are available for an additional price. Not valid towards any other digitizing services. Terms may change without notice. Promotional value expires 6 months after your order is placed (unless prohibited by law). Order today, but do not rush sending in your pictures, but do so within 6 months from your purchase date. Promotional value cannot be combined with other offers. Purchase, use and acceptance of this package constitutes acceptance of all terms. 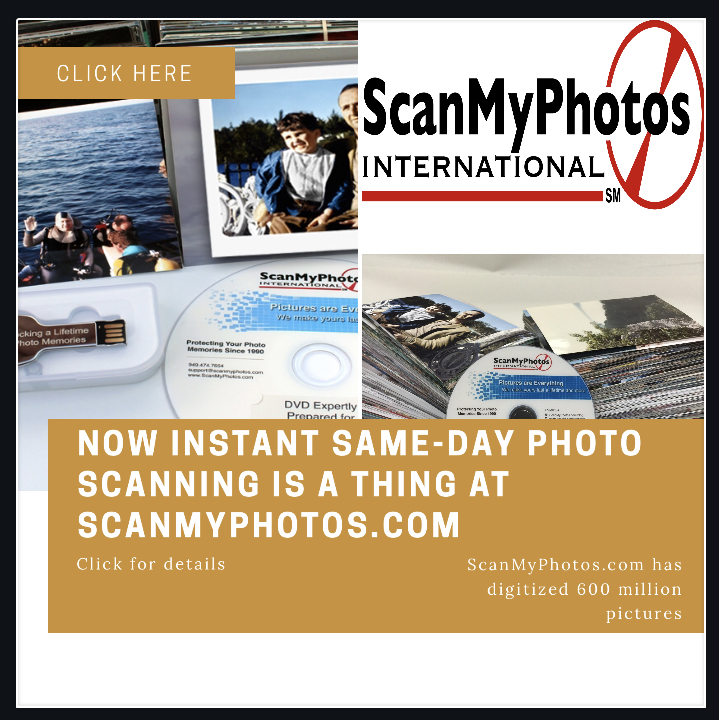 This entry was posted in Blog, digital imaging and tagged #photoscan, bulk photo scanning discount package, express photo scanning, fast same day high resolution photo scanning, FastFoto, Kodak Digitizing Box, same day photo scanning by ScanMyPhotos.com. Bookmark the permalink.